Welcome to Flashback Friday – Where we share previously published articles which were reader favorites. Hope you enjoy this Friday’s article, originally published in 2013. During my recent 4,000 mile Road Trip Adventure I visited quite a few interesting places. 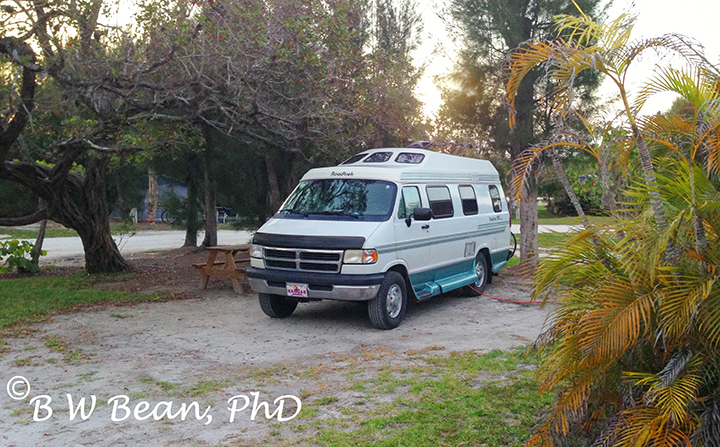 My stay on Sanibel Island in Florida was one of the more peaceful and laid back experiences of the journey. Of course, I always enjoy photography on my journeys and I take lots of equipment with me on my road trips. But in addition to all my high tech camera stuff I also have my trusty iPhone. Surprisingly, the iPhone is a fairly decent camera. Here are a few of my Sanibel experiences by iPhone. Sanibel Island is known for it’s miles of long sandy beaches. And if you like looking for sea shells – Sanibel is the place for you. Every morning walkers cover the beaches gathering up a wide variety of shells. Bending and stooping to examine shells is great exercise. But it can lead to a sore back – a malady known locally as the Sanibel Stoop. The photo above shows some walkers on the beach with one of the lighthouses in the background. I drove my Road Trek to Sanibel. I set up camp at Periwinkle Park Campground which is a great spot with very nice and well maintained grounds and great services. From Periwinkle I mostly toured the island by bicycle. 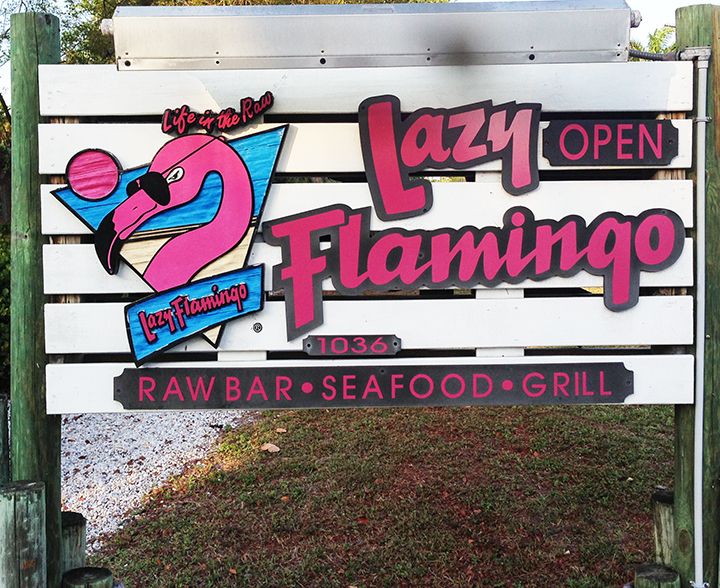 The Lazy Flamingo is a great local restaurant located within easy walking distance of Periwinkle Campground. A great place for some local food and a brew or two. I managed to eat several times at the Lazy Flamingo. I frequently had the mesquite grilled fish of the day. 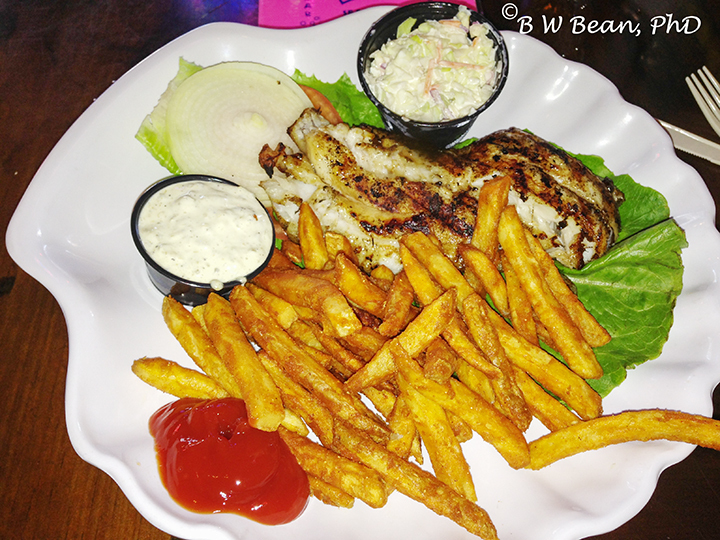 The freshly caught mesquite grilled grouper was really out of this world! Highly recommended! 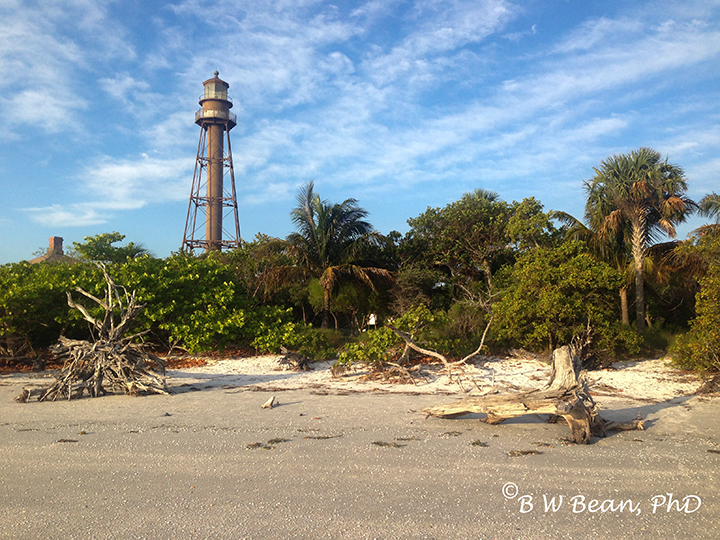 Hope you enjoyed my version of Sanibel Island by iPhone. Sanibel is a great place to kick back, relax, and enjoy the sun and beach. De-stress, read a book, take a walk, ride a bike. Do some shelling. Enjoy some seafood. Life is good! 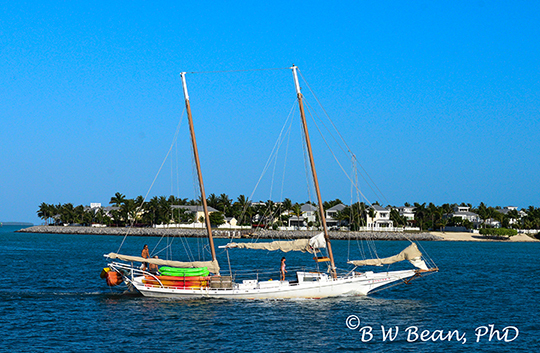 The Sanibel Experience ………….. Enjoy the Adventure!